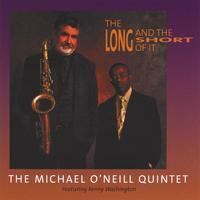 On The Long and the Short of It, the Bay Area-based Michael O'Neill Quintet has devised a unique role for featured singer Kenny Washington. 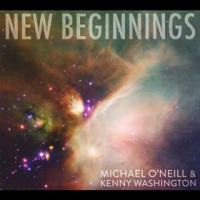 Washington sings a number of standards in a fairly straightforward manner, but on the originals by O'Neill, he is essentially used as another horn, vocalizing the melody or harmony along with the horns of O'Neill and Steve Campos. After this initial statement, he takes his turn along with the other soloists. There is ample opportunity for this arrangement to become, well, annoying, but Washington makes it work by virtue of his vocal range and improvisational imagination. The quintet turns in a sensitive performance of the perennial "The Nearness of You featuring a charming, almost bashful-sounding solo from O'Neill. In addition, Washington turns in a vocal performance that is both soulful and modern, betraying the spirit of his acknowledged influences, Stevie Wonder and Donny Hathaway. Elsewhere, on the O'Neill original "Masai, which features percolating percussion from Danilo Paiz, Washington assumes the role of third horn and blends nicely with the band until he swoops into a solo that leaves no doubt about the expansiveness of his range. More often than not, "Caravan is destined to be a highlight of any program, and the tense reading turned in by the quintet does not disappoint. The Long and the Short of It features a thoroughly accomplished band blessed with the presence of a gifted singer who functions as part of the band and not as some sort of conspicuous and garish ornament. Such musicianship is rare and always welcome. Visit Michael O'Neill on the web. Track Listing: It's Alright With Me; Masai; The Nearness Of You; Kilimanjaro; Grey Whale Cove; Caravan; I Know What Love Is; Bye Bye Blackbird. Personnel: Michael O'Neill: tenor and soprano saxophone, clarinet, bass clarinet, flute; Kenny Washington: vocals; Steve Campos: trumpet, flugelhorn; Michael Bluestein: piano 1-4, 6, 8); Murray Lowe: piano 5, 7); Peter Barshay: bass; Alan Hall: drums; Danilo Paiz: percussion.